Ailing Second ‎Republic Vice President, Dr. Alex Ekwueme, was Sunday morning flown abroad for continued medical treatment. 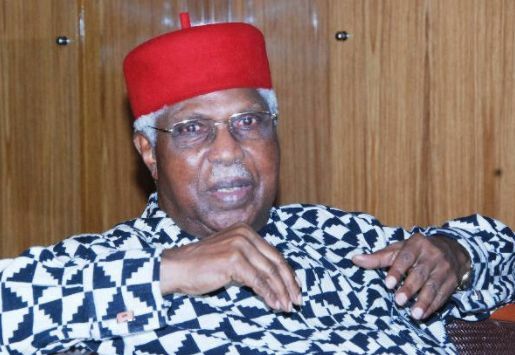 Ekwueme was brought to the Akanu Ibiam Int'l Airport, Enugu with a National Orthopedic Hospital Enugu, SUV ambulance at about 7: 26 am and driven straight into the tarmac, where he was taken into a waiting air ambulance. The white Air Ambulance was said to have arrived the airport late Saturday evening and spent the night at the airport. He was transferred into the aircraft in the presence of his family members who escorted him to the airport. This was even as Vanguard’s correspondent in Enugu, Mr. Dennis Agbo, who witnessed the event was attacked by soldiers, policemen and other airport security officials before they forcefully confiscated his camera, mobile phone and other working tools. Some of the securitymen who were attached to Ekwueme as well as his family members forcefully deleted all the pictures of the Air Ambulance from his camera and mobile phone which they seized, threatening to visit him personally, if the story of the incident was published. Agbo was briefly detained at one of the offices in the airport, where his mobile phone and empty camera were later returned to him. However, the aircraft took off from the tarmac at about 8: 37am with the family members waving to whish him a safe trip. Among the family members present, included Ekwueme’s daughter Mrs. Onyemelukwe, who is a running mate to the Peoples Democratic Party, PDP, governorship candidate for Saturday’s gubernatorial election in Anambra State. The family members had earlier declined comments on the former vice presidents illness, saying that they were not in the mood to speak to the press and did not need any media coverage.